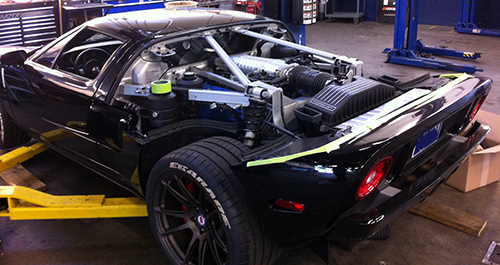 We have the pleasure of working some of our magic on another GT. 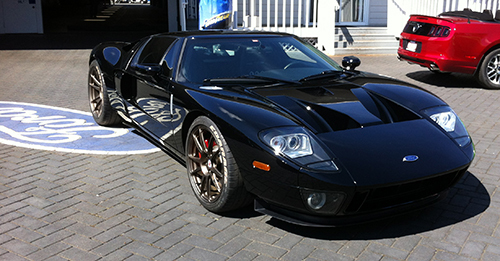 We plan on doing some cosmetic alterations, a performance upgrade and interior modification. We will do a bumper delete kit, modified exhaust system, change and move the bass speaker system and add a center console lid and cubby. 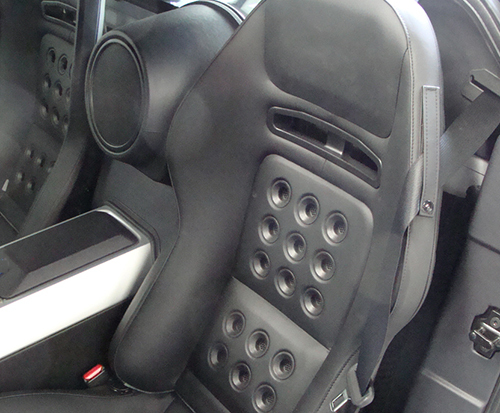 We also sent the seats out to be customized. The bottom section is changed so taller people have more headroom. Tailored by Knights does a great job. 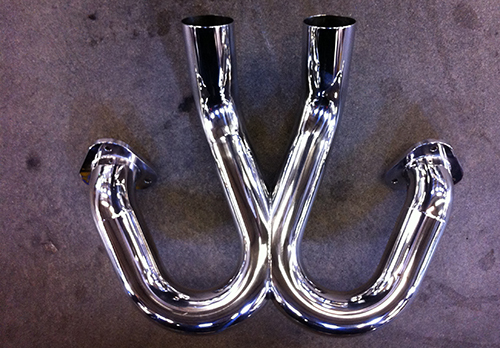 The first modification we are going to do is remove the stock muffler and replace it with Accufab X pipe. 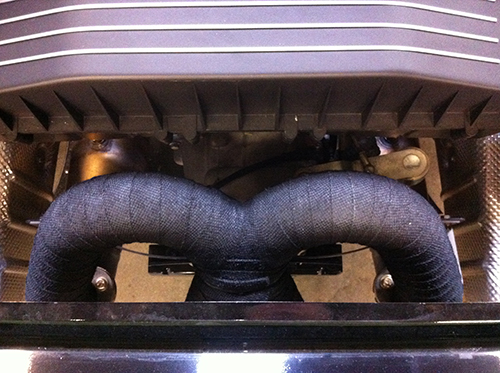 The stock muffler weighs 57 pounds and makes for a very quiet exhaust. We have found with this modification that at the lower rpm range the noise level isn’t too loud and it really has a nice bark at higher rpm ranges. At the same time we are going to take off the stock bumper and install a bumper delete kit (The GT Guys provide these!). 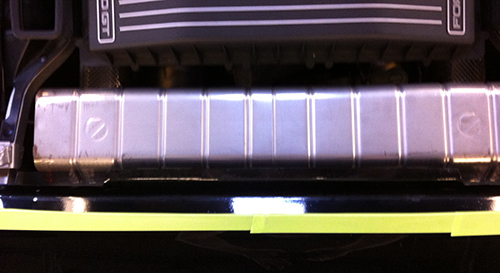 We are in the habit of taping off all the edges with green painters tape. It doesn’t leave a mess and protects against bumps and chips. The clam shell (that is what Ford calls it) comes off and is stored. 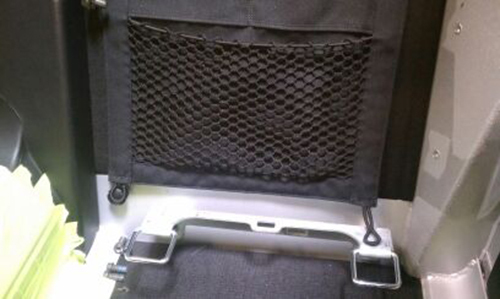 It comes off very easily by removing two pins, unhooking the defroster grids and strut supports. Out comes the muffler. 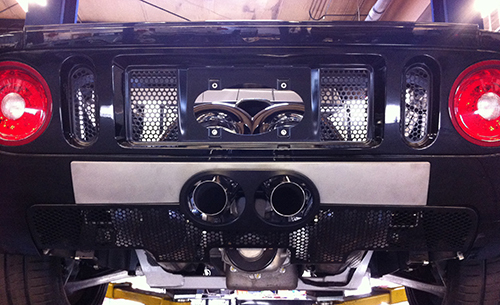 We remove the bumper, bumper rails, stock exhaust trim and bezel. We dry fit everything and then cut the exhaust to the correct length. Since the X pipe would fit a car with the bumper, it has to be cut down. After we have it the right length, we run it to get hot so we can send it out to get wrapped. 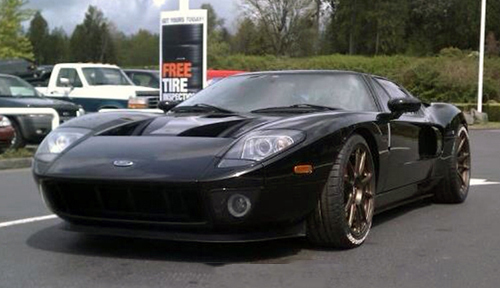 Shadowman at Discovery Automotive wraps it and paints it. Buff very carefully cuts the tips to the right length and then we send the pipe off to Shadowman to get wrapped and painted. 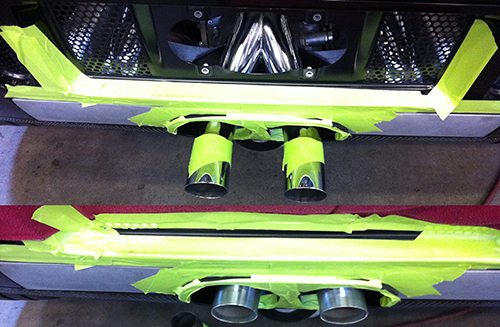 We also send out the new bumper delete pieces to Fender and Fins to get painted. Wrapped, painted and installed (looking down from above). Here is a before and two after shots. Looks pretty sweet! 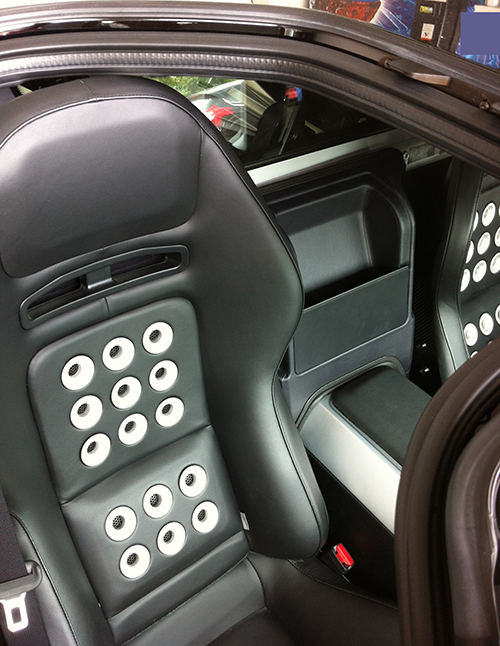 During this step we will take out the seats and send them to Tailored by Knights. 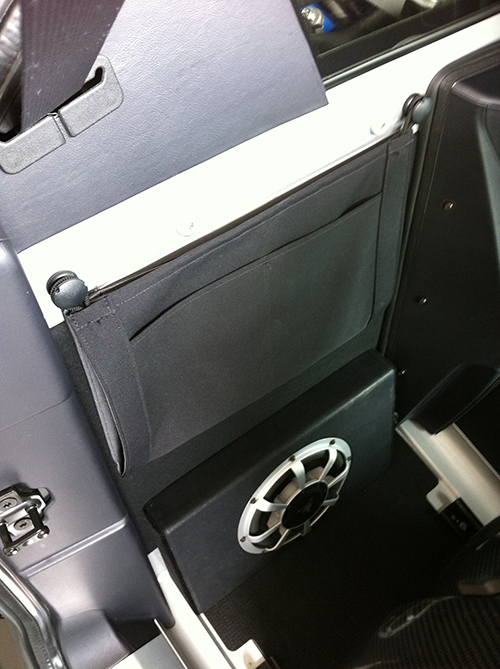 The lower portion of the seat is modified so it sits lower giving the driver and passenger roughly 2 additional inches of headroom. We will also modify the center console to have a lid that opens and you can put your garage opener or whatever small accessory into a cubby that keeps it secure and restrained (for those high G turns and launches). 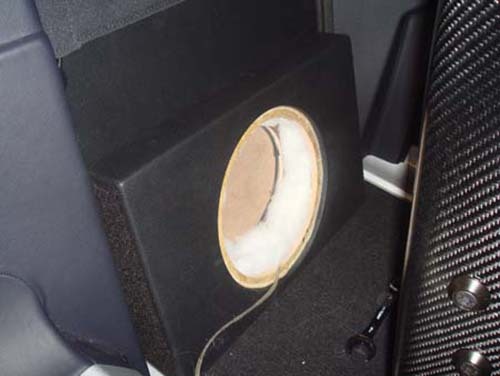 And last, we modify the OEM bass speaker/amplifier assembly to take up less space and put a OEM leather bulkhead cover in its place. Here is what it looks like before we start. Note: This photo was from another job as I forgot to snap a picture before we took it out. 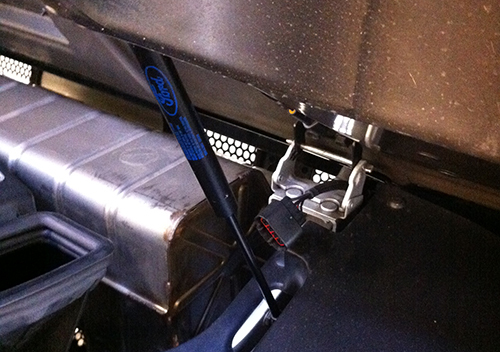 Next we must remove the child seat anchor bracket that is for securing a child seat in the passenger seat. Next we remove the bass speaker/amplifier components and separate. 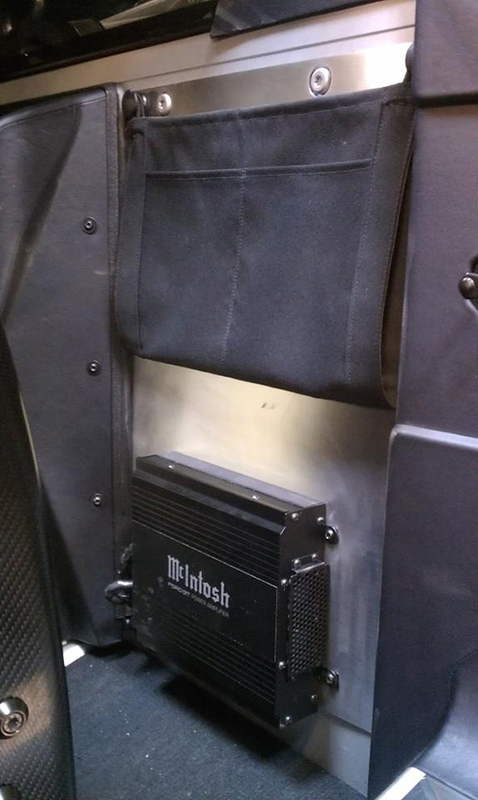 Now the wiring is routed to the new speaker box (passenger side) and to the amplifier (drivers side). Looks like it belongs there, doesn’t it? And, the seat goes back and the sound is great (I think it sounds better than the original set up! We fabricate a mount for the amplifier (seen here before paint). After a vacuum and wipe down it looks great. Here is a view looking in and down from the passenger side.